I am hugely indebted to Frances Gough at Headline, Bookbridgr and Tinderpress for allowing me to read and review this incredible text. 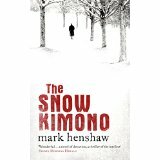 It has taken me several days to read ‘The Snow Kimono’ because Mark Henshaw’s writing is so beguiling, intricate and multi-layered I needed to keep stopping to reflect on what I’d read. Set initially in Paris in 1989, but weaving across the past of Japan and Algiers too, the story concerns newly retired Inspector Jovert who encounters the enigmatic Tadashi Omura in their apartment block. The two talk together and Omuru reveals a tale of the exceptional Katsuo Ikeda and the women in his life. I found the plot a little like gathering smoke. It kept slipping from me and leading me astray so that the final fifty pages or so gave me the same revelations and shocks as they give to Jovert. The style is totally hypnotic. Looking back, whilst writing this review, I can see the hints and connections that I missed at first. This is one of the skills of Henshaw. His themes of truth, betrayal and deception are woven so successfully into the narrative that the reader is forced to consider their own perception of memory and truth. What completely drew me in was the poetic, mesmerising language. I found some of it so beautiful I felt it could have been set out as poetry. Each of the senses is indulged by reading this book, from ‘the tock, tock, tock of a water clock’ to the ‘fat padded toes of a lizard’. To be honest, ‘The Snow Kimono’ is not an easy read. Written with sublime care and attention to detail, it deserves the same attention in its reading. It won’t be for everyone, but I thought it was well worth the wait of its creation.